I saw one of God’s promises the other day, and it was stunning. I usually get up at 6am on weekdays, but I felt convicted to spend time with God and set my mind on Him before getting wrapped up in my day. This is a huge thing for me, because I barely get enough sleep as it is. I decided to start small, and set my clock to 5:45am. I felt like a zombie as I dragged myself out of bed. I grabbed my Bible, mumbled a quick “Good morning, God,” and tried my best to read through blurry eyes and a tired spirit. It was such a small thing, I wasn’t even sure God had noticed. After 15 minutes, I set about my regular morning routine, and even left for work a few minutes early. I always take the interstate for part of my 40-minute commute, during which time I try to listen to Christian music and focus my mind on God. This morning, God let me know that He was focused on me, too. While cruising and singing along to the radio, I looked up and saw a huge rainbow! Not just any rainbow, but a vibrant double rainbow, stretched across the entire sky. I looked around, as if to ask my fellow commuters, “Do you see that? !” But they didn’t seem to notice! I then realized something interesting – I could see the rainbow through the windshield but not through the driver’s side window. I spent the next few minutes trying to figure out how the rainbow was playing peek-a-boo with me. It appeared the brightest through the un-tinted windshield, especially when I was wearing my polarized sunglasses. However, the rainbow was not visible at all through the tinted side window, with or without my polarized glasses. I reached work within 10 minutes, but when I parked, the rainbow was nowhere in sight. I asked some co-workers if they had seen it, but they hadn’t. I realized that if I hadn’t gotten up when I did, I wouldn’t have left for work a few minutes early, and I wouldn’t have seen the rainbow at all. Genesis 9 records the moment that God set the first rainbow in the sky. He had just flooded the earth, saving only Noah and his family and select pairs of each kind of animal. I imagine Noah’s family were relieved that they had been spared, but they must have also been scared that they might not be so fortunate the next time around. God, in His mercy, knew this and understood that future generations would be afraid, as well. This is why He made a covenant, or promise, to never flood the earth again. Typically, when covenants were offered in those times, something of value was given for collateral, like a sandal or a coat. In this case, God set His collateral in the sky – a beautiful colorful arc, in the shape of an archer’s bow. It’s been a long time since God flooded the earth, so most of us aren’t worried that He will do it again. Yet, God’s rainbow still sits on every cloud with promises that God is with us and is for us. On this particular morning, it was also reminder that God was thinking of me, just as I had been trying to focus my thoughts on Him. I was moved by the sight of the beautiful rainbow, but I also perplexed by the way it was invisible through the tinted window but extra-vibrant through polarized glasses. I did a little research and learned that tinted glasses (and windows) are just darkened, so they can reduce the visibility of certain colored lights. Nowadays, you may often hear that a well-known figure, such as a political candidate or news reporter, has “polarized” a situation, meaning they have divided their audience in some way. This is always said in a disapproving manner, implying the person should have sought agreement or harmony among their audience. However – and this may be groundbreaking news for you – we serve a polarizing God. The Bible is full of polarity: good or evil, black or white, right or wrong, right or left, east or west. If we are to follow God and do His will, we need to understand that His grace and mercy are intended for everyone. However, His very message of mercy and redemption is polarizing – we must choose God and His way for our lives, and we must choose to avoid other paths. If we see the world the way God does – through “polarized lenses,” if you will – we can see God’s blessings and His promises. However, if we see the world the way non-believers do – through “tinted, darkened lenses” – it can be difficult to spot God’s promises. In fact, we can drive right by them and not even notice they’re there. By devoting just 15 minutes to God that morning, I chose to put God first; I was reminded that He still keeps His promises and He rejoices over even the shortest of times with me. I also learned that when I see the world through God’s eyes, I can see His promises more clearly. What a difference 15 minutes can make! Of course, it’s been difficult to keep up the 5:45am routine, and even when I do, I don’t always see rainbows on the interstate. But I do know they’re in every rain cloud. And I know that God appreciates every moment I choose to spend with Him. Lamentations 3:22-23, NAS The LORD’S lovingkindnesses indeed never cease, for His compassions never fail. 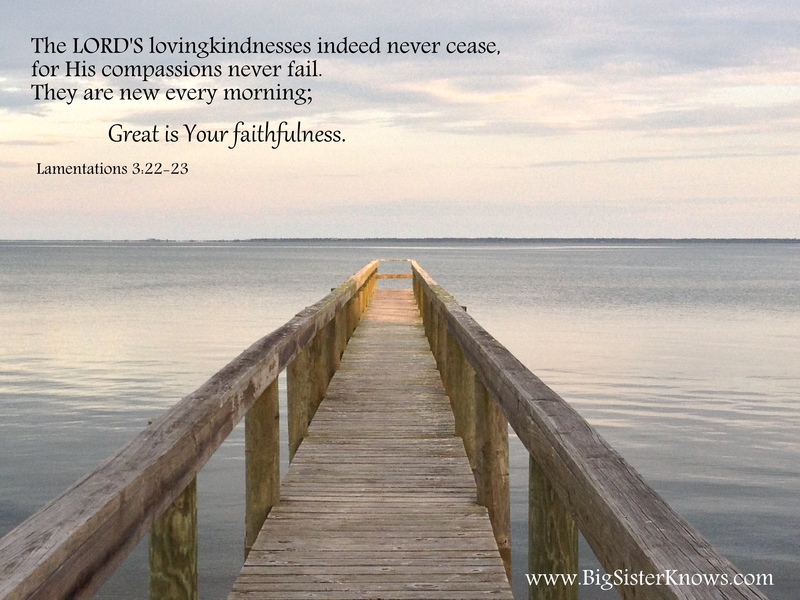 They are new every morning; great is Your faithfulness. My aunt gave me a beautiful wall hanging years ago that summarizes this scripture: God’s promises are new every morning. How beautiful! That’s something to wake up to, isn’t it? Has it been awhile since you’ve seen God work in your life? Do you feel like you’re missing out? I challenge you – not just to spend more time with God, but to have a real conversation with Him. Let Him know that you want to experience more of Him in your life, and ask Him to help you see the world through His eyes. Then listen for His response and look for Him everywhere. God can show Himself to you in the most unusual and colorful of ways. Thank you, Ashley. May I share your photo?